In impoverished communities, the 'successful' people are usually drug dealers or gang bosses. Christel House shows kids the job opportunities they don't see at home. Starting in Grade 7, Christel House introduces career guidance to begin preparing students to study careers that will optimize their strengths. Christel House helps them select universities, determine their course of study and identify a career path. Students are assisted in completing admissions applications, securing scholarships and preparing for interviews. They receive tuition assistance, stipends and continued medical services if they continue post-secondary studies. And we stay in regular contact with universities and employers, to mentor students through successful academic performance and job placement. Our College & Careers programme keeps the door open to a brighter future for our graduates. Unique to Christel House and key to creating active citizens, the College & Careers programme guides learners in the last leg of their journey from graduation to employment. 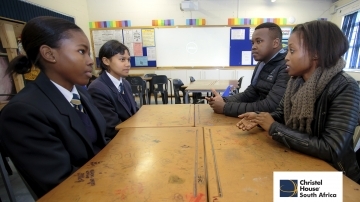 After Grade 12, learners are supported and mentored through continued education and/or apprenticeships until they are firmly established in the work force. Education has always been a great equalizer, and a pathway to a better life. Our students remain in school and our graduation rates are in the 90th percentile—a remarkable statistic for any school, especially one serving a high-risk population. Christel House also ensures that students are exposed to various industries by facilitating job shadowing activities, transporting them to and from their job shadowing experience to ensure maximum participation. Each year, the number of students in this programme grows as more students graduate from Christel House. As alumni, they are encouraged to volunteer and support Christel House financially. "The Christel House learners and graduates from my community stand out above those who attended other schools—in terms of dress, conduct, behavior and education. Christel House instilled values in me that will remain with me for the rest of my life."